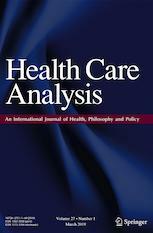 Health Care Analysis is a journal that promotes dialogue and debate about conceptual and normative issues related to health and health care, including health systems, healthcare provision, health law, public policy and health, professional health practice, health services organization and decision-making, and health-related education at all levels of clinical medicine, public health and global health. Health Care Analysis is committed to the view that all aspects of health – from the social determinants of health, to healthcare delivery to health systems – are interrelated, and publishes papers that explore links between some of these areas. As a journal for everyone interested in philosophical issues in health and health care, Health Care Analysis seeks to support the conversation between philosophy and policy, in particular illustrating the importance of conceptual and normative analysis to health policy, practice and research. It publishes contributions from philosophers, lawyers, social scientists, healthcare educators, healthcare professionals and administrators, and other health-related academics and policy analysts.